The 3D map is generated at runtime with real world scale (I just set the latitude/longitude) and shows as soon as I zoom out. If I had been able to walk up to the placed sign the giant scale of it would have been more clear. I love it when people provide SLurls for their photos because it helps me with the is it Life or is it Second Life quandaries. Who “One Light-Second Per Day” is may be a mystery, but there is no doubt that this person has a great talent revealed in their small, emergent photostream. I love this photo that has a light leak overlay added to give it the feeling of sun damage. Without the light leak, it is a memento of seeing a penny farthing bicycle while club-crawling at 1 a.m. With the damage, it incorporates the idea of a quick Polaroid snap tossed on the dash as you drive home the next day. It incorporates not only the memory of the bike, but the heat of the sun on your car as you drive home from sightseeing. The photographer seems to set the WindLight to a time of day, inspired perhaps by Monet's Rouen Cathedral paintings. Perhaps someday One Second may come back and shoot the same picture at another time, perhaps not. However, giving us the time and place can allow us to go there and see what they saw when they saw it for ourselves. In its “9 a.m.”, the sunrise is so bright these two men are in silhouette and the sea disappears into the sunshine. The land meets the sea at a third from the bottom. The man on the left is just a hair left of a third from the left and the other man is dead center. Even though it’s early morning, for some reason this picture makes me think of a book cover, perhaps for one of those sad stories of love thwarted by feuding families or even a mystery. Despite the brightness of the sun we cannot see, there is something melancholic and even eerie about this photo. Will SL be moving to a new engine like Unreal or Unity, and if so, will our scripting etc still work? If not, why not? There are no current plans to move over Second Life to a different engine. We'd rather focus our engineering efforts on continuing to improve our existing engine to ensure that there is no interruption to ongoing compatibility for our millions of Residents. EEP has ruined teleports and region crossings for a lot of people. As well as TP crashing, crashing and unseating has increased by many time since EEP was put into the server code in March. When will that be fixed? We are aware that some Residents have had an increase in disconnects during a teleport. These occur when an avatar attempts to teleport to a new Region (or cross a Region boundary, which is handled similarly internally) and the teleport or Region crossing takes longer than usual. We’re working quickly to fix the issue. Incidentally, while the wide deployment of the bug that we believe is behind the TP disconnects did coincide with EEP server deployment, it's actually unrelated to the EEP features. Readers can check out our Tools & Technology blog for updates as we continue to roll out any fixes. Bridget G. is a storyteller. Her photos are full of the little details that shift it from a static set to a dynamic scenario. Take this untitled photo on a motorcycle. There’s the bit of windswept hair and the dirty feet that add authenticity and make it felt, not just observed. She’s going against the stream of traffic, too. There’s a story here and though we don’t know the details, we know it is a good one. 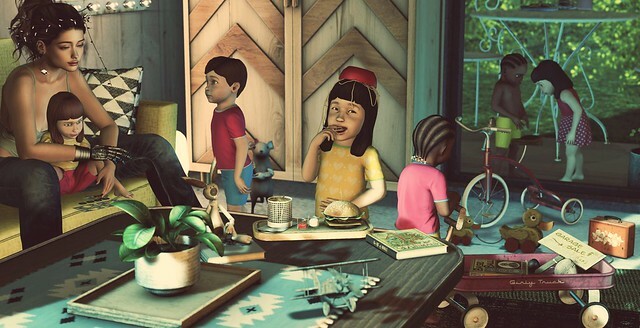 “This is Wednesday” is a humorous wink at taking care of children. She looks exhausted, her pose is slumped, the kids are being kids. There’s an interesting transhumanist element with her hand and slightly demonic glare that little girl is directing at it. A thing that Linden Lab should reconsider is to allow the LL marketing team to provide marketplace and/or in-world shop links to the stuff that appear in the pics and vids blog posts. A big reason why [SL] content-influence blogs are popular is because of the links to where the readers can get the stuff shown. Not just in SL but in the real world as well. Some well-known person wears something and the next day the shops are full of people wanting that garment. I'm fascinated to find out how often real world fashion in pop culture immediately influences virtual world fashion shopping. But irihapeti's core argument is this: Linden Lab should actively promote user-owned SL brands and commercial content on its massive social media channels. 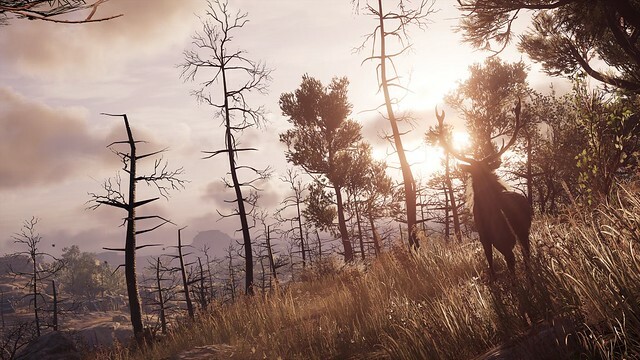 Michael Ry's screenshots from Assassin’s Creed Odyssey caught my eye immediately -- such as this beautiful elk caught in silhouette by a brilliant sun. The Rule of Thirds is used in both vertical and horizontal composition. Here's a great podcast interview of Philip Rosedale on the podcast show Stayin' Alive in Technology hosted by Melinda Byerley, former Head of Marketplaces at Linden Lab, and known in SL as Pink Linden. And because she is a Linden vet, this is a much more substantial, in-depth interview, and brings up some points I've not heard Philip discuss before. (Streamable above.) It's also an important companion piece to the recent bombshell video where Philip announced scaling back High Fidelity content and making it more desktop client-focused. Byerley is now founder of Timeshare CMO, a data marketing firm where Catherine Smith, another Linden Lab veteran, also works. "It's a recap of Philip's history, his thoughts on the 3D web and the future of VR," Catherine told me, when sending over the podcast. "What he's learned over the years. It was very Philip and made me laugh and smile and miss working for him!" So this is an interview with the founder of Linden Lab, speaking with a Linden, which was promoted by a Linden, and is now being blogged by a Linden.